Ikväll visar TV3 filmen "Panic Room" med start kl 23.40! Kristen håller just nu på att spela in filmen "Camp X-Ray" bilderna är från inspelningen den 17 juli. 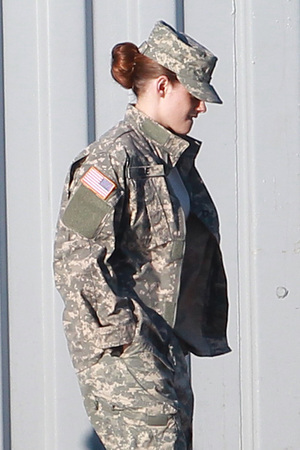 Kristen Stewart was photographed wearing army uniform on the set of upcoming indie drama "Camp X-Ray" in Los Angeles yesterday (July 17). The 23-year-old actress, who was recently romantically linked to Boardwalk Empire's Michael Pitt, wore US military gear and her hair scraped back into a bun to as she filmed scenes on a boat. The star plays a young soldier stationed at Guantanamo Bay who receives abuse from the men in her charge before striking up an unlikely friendship with a prisoner.